Just a few quick pictures before I head off to work. Remember the brown and blue fabric from a couple of posts ago...well this is it. 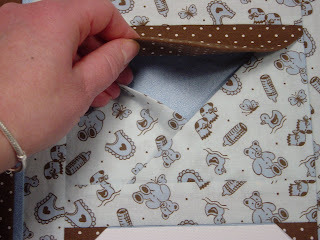 I made up this pattern a long time ago for baby shower presents for friends. I actually sold a few tops on ebay years ago. I just loved this blue and brown fabric, so I thought I would put one together and show you. This close-up is the birth information card. The little fabric corners hold in the card. 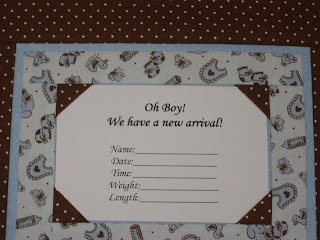 and this is a little envelope that can hold little bits of memories about the baby...lock of hair etc. I have a question: if I sold these on etsy, would it sell better as a quilt "top" or as a complete wall hanging, but I would charge more for the completed one, for the batting, backing and the extra work of quilting? I have a pink one that I finished last night, but I'll post a picture later. 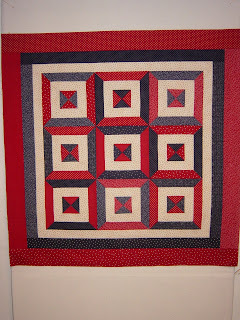 These last 2 pictures are just of a quilt top I finished a few days ago. Off to work...have a great day. That is so darling and I love how you can save locks of hair in it also. I think I would buy it as a wall hanging, and your other quilt top is beautiful, I love the colors. 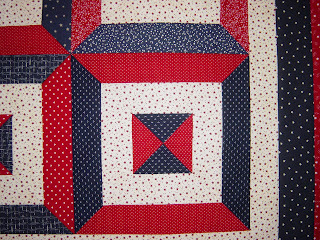 What a prolific quilt topper you are! Just found your blog, it's very informative as well as posing questions lots of us are interested in. I've had a hexagon quilt on the go since before I got married in 1996. I usually take mine on holiday with me so it's travelled some. 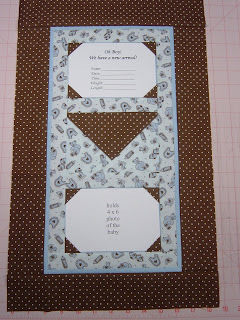 I was interested in how you do your hexagons without the need to stitch through the template. I'll have to try it. I'll keep calling back to see how your Grandmother's Flower Garden is doing. Hi, I think I would call it a quilted wallhanging. and I love it so much!!! That is precious...I would call it a wall hanging because that is how I would use it. You could use the same idea for a wedding too. I love that baby wall hanging. I would think you would want to have it finished. But only because people probably aren't going to want to finish it. Know what I mean? Its just too cute! A friend had made one of these for me and I love it. It actually holds pictures of my cats, because she used cat fabric. I think it would sell better as a quilt. I love your version. Karen you come up with the neatest ideas. There's that red, white and blue thing happening again! 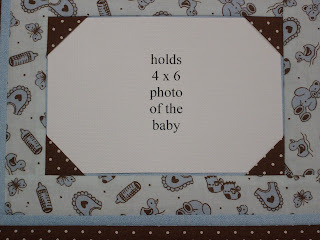 I love the baby wallhanging...what a cute idea! That is very sweet and a wonderful idea. I would buy it as a wall hanging!!! OK, when do you start selling these. So cute, and great idea! I love the baby WH, very creative idea! I love the baby top. I've just discovered your blog. I've recently have a baby girl and it's a great idea!!! Would you pleaseeee make a tutorial on making this?